Broken ice maker? Are you experiencing any of these common electric ice maker problems? The ice maker won’t turn off — it keeps making ice! 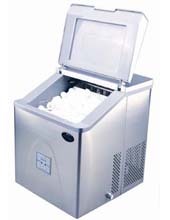 There are a number of causes of ice maker problems — such as a defective ice level control board, clogged filter, bad ice maker mold thermostat, defective water inlet valve, broken ice maker assembly unit, faulty ice maker module motor or ejector arm, broken shut off arm, or a defective freezer door switch. We’re here to get your ice maker working again! Contact AMPM Appliance Repair at 800-343-6011 and we’ll send one of our friendly, knowledgable ice maker repair technicians to quickly diagnose and fix the problem. Our appliance repair techs carry a vast inventory of parts for all makes and models of freezers and ice makers to ensure that we can handle just about any type of residential or commercial repair on the spot. 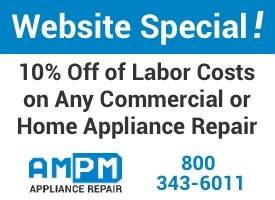 Special Ice Maker Repair Coupon Offer: Mention that you found us online to receive a 10% discount on the cost of labor!